Gout is the oldest form of arthritis known. 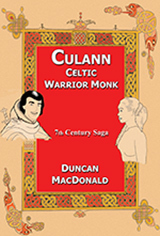 They used to call it the disease of kings, because in early times kings were some of the few able to enjoy a rich diet. 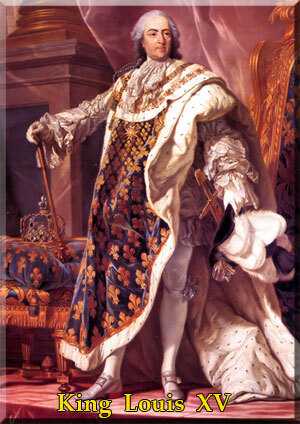 Many royal families were highly affected by gout. A type of arthritis in which crystalline deposits of uric acid form within joints, particularly at the base of the big toe. Age: Most common between the age of 30 and 60. Genetics: Often runs in families. Lifestyle: Being overweight and excessive intake of beer, stout and spirits. 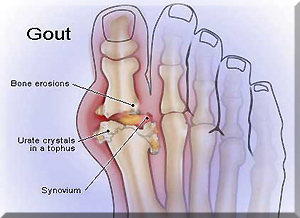 Gout causes sudden inflammation and pain, usually in a single joint. The base of the big toe is the most common joint although any joint may be infected. Gout rarely appears in women before menopause. 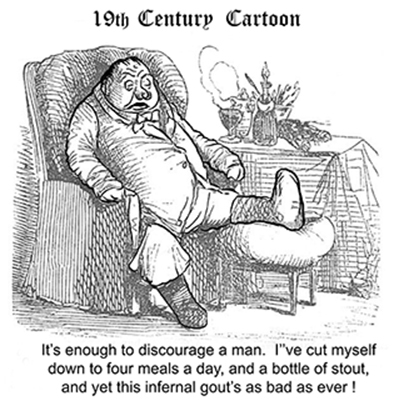 Gout suffers may want to raise a glass of red wine, not beer. A new study finds beer increases the risk of gout, while wine does not. Dr Hyon Choi, a rheumatologist at Massachusetts General Hospital, Boston, the study's lead author said "Individuals with gout should limit or cut their beer consumption. However "wine may be allowed and may even have other health benefits associated with moderate alcohol consumption." Their study which tracked 47,000 men over 12 years, found that men who drank a glass of beer or stout or a shot of spirits a day, saw their risk of developing gout rise by 30% compared with non-drinkers, while those who drank between 2 and 4 glasses of beer or stout faced almost double the risk. An attack of gout is usually caused by raised blood levels or uric acid (a waste product of the breakdown of cells and proteins). An excess of uric acid may be caused by the overproduction and/or decreased excretion of uric acid and may lead to uric acid crystals being deposited in a joint. The underlying cause of gout is unknown, but the condition is often inherited. A few people with gout also develop kidney stones formed from excess uric acid. Gout may occur spontaneously or be triggered by surgery, being overweight, drinking beer, stout or spirits, treatment with diuretics or excess cell destruction associated with chemotherapy. • Redness, tenderness, swelling and warmth around the affected area. • Pain, which may be severe, in the affected joint. If your doctor suspects you have gout, he will obtain a blood test to measure your uric acid levels. To confirm the diagnosis, he or she may arrange for you to have a joint aspiration (see photo) in which fluid is drawn from the affected joint and examined for uric acid crystals. Gout may subside by itself after a few days. To reduce severe pain and inflammation, you may be treated with a nonsteroidal anti-inflamatory drug, the antigout drug colchicine, or with oral corticosteroids. If gout persists your doctor may give you a corticosteroid injection directly into the affected joint. Red wine Yes - Red meat No. A recent study by the New England Journal of Medicine  found the more red meat males ate, the higher the risk of developing gout. Those who consumed the highest amount were 40% more likely to develop gout than those who consumed the least. Consumption of all types of seafood also proved to be a big risk as those who ate large quantities of seafood were 50% more likely to develop gout. (Note: seafood however can have a beneficial effect on heart disease). The study also showed that low-fat dairy products decrease the risk of gout and that total protein intake had no effect. Chances are you or someone you know has arthritis. It causes pain, stiffness and sometimes swelling in or around joints. Treatment can take the form of painkillers to relieve symptoms, physiotherapy to keep the joints mobile and severely damaged joints may be replaced surgically.